Little did I expect what would follow. In true First Take style, right after debating whether or not Peyton Manning was the greatest QB in the history of the NFL, the next segment was fully devoted to whether or not Aaron Rodgers was still the best QB in today’s NFL. You know, ahead of the guy they just said might be the GOAT. The surreal event of watching Stephen A. Smith and Skip Bayless hold a printout copy of my Insider article on Rodgers so they could argue about it is something I never would have expected and never will forget. The fruits of my labor made it like Christmas morning for Bayless, as he has argued his ridiculous “lack of clutch gene” narrative — ridiculous in that no gene exists for anyone — on Rodgers for years without doing the research to support it. He has something now, just as anyone should when I first wrote about the front-running Packers before the 2011 season started. 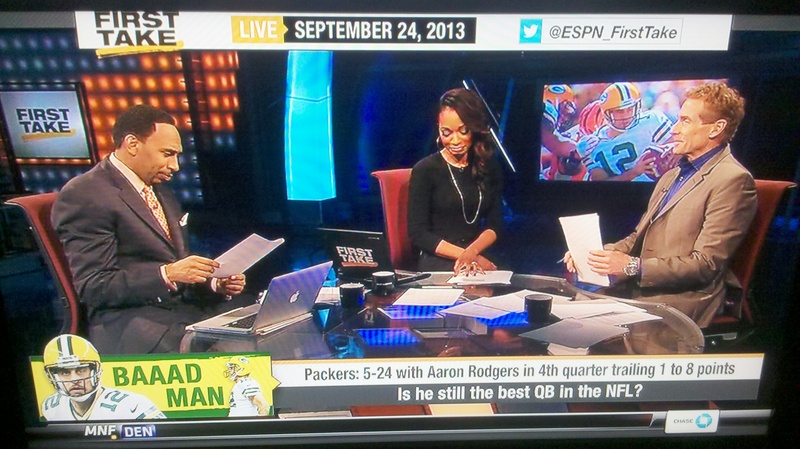 This is nothing new to long-time readers, but it took a push by ESPN to finally get the numbers out there. So if Green Bay’s historic struggles to win these games is a story going forward, then I have done my job. First, allow me to expose a little secret: Monday’s article was a last-second backup plan after the events of Sunday’s early games made a piece I did on the AFC null and void. So after the dramatic game ended between Green Bay and Cincinnati, I pitched a topic I’m very familiar with and have plenty of research on already. I never said Rodgers is not clutch. I don’t write about the “clutchiness” of QBs. I write about what happened in clutch situations. Clutch is a history, not a skill. I never said the 5-24 record at comebacks or 9-26 record at game-winning drive opportunities is all Rodgers’ fault. In fact, my first mention of this goes right to head coach Mike McCarthy. I understand the article is behind a pay wall, so not everyone was able to read it (hint: try Google). But there are claims out there on things I never wrote in the piece. I also did not write the line “Recurring fourth-quarter failures prevent him from being NFL’s top QB” under the title, however I agree with it 100 percent. I’m not going to put Rodgers ahead of Peyton and Tom Brady, who have the gaudy stats, records, MVP awards and Super Bowl rings too. They also have a larger body of work. But the main difference comes in that I can still trust those QBs when the game does not start as planned and they have to win it late. I don’t trust Rodgers in the same fashion, which is why I had little faith he would get the go-ahead drive on Sunday in Cincinnati. I’ve written thousands upon thousands of words on this topic before, so anyone thinking this was a knee-jerk reaction to Sunday’s game just doesn’t know my work on the topic. By the way, I’m limited to around 1,500 words on Insider, so any thought to being able to fully explain away every loss in the 9-26 record is a pipe dream. I make sure I cover my bases. So that’s what I wanted to say about the Insider piece itself. As for any fan criticism or written defenses that have come from other writers this week, now I will respond to those. I’m not as nonchalant about things as Rodgers, who responded with “Yeah, I’m not worried about that at all” when ESPN’s Jason Wilde asked him point blank about the lack of success in these games. I probably need to get that way to survive in this business, but I probably like arguing with people too much to stop completely. There were many comments, e-mails and articles this week in response to my work. I’m not going to link to any of the articles as I didn’t see any that attacked me personally. If I did, I would have responded accordingly. I’m just going to go over some of the general faults I found. No one’s done the same study I have done. It’s hard to compare (straight up) any past study of close games if you’re not looking at things the way I do, which is 4th quarter/OT, tied or down by one score. What I do takes an eternity for one person to compile, so I don’t think anyone could have accomplished that the last few days. Stats in the final 5:00 – Sure, we can look at these, but that leaves out a lot of what goes into the 5-24/9-26 records. It’s not just about what you do when you’re behind, but it’s how you protect that lead or how you avoid getting into these situations late in the first place. Win-loss record at 4QC/GWD should not be thrown away like trash – You can read my rant on this from FO here. We can take these stats and just look at how good a guy is at scoring a TD when he’s down 4-8 points in the 4Q, or scoring a FG when he’s tied or down 1-3. We can break them up that way and maybe get something useful out of that. The only reason I haven’t done it is because I’m still trying to put together a full database for every single opportunity in the last 30+ years. That takes time. However, the record, the wins and losses (and sometimes ties), is the starting point for knowing which games to look at. We can’t just ignore it. While we can break the games down and see why the team won or lost, we need to be taking 4QC/GWD, which are situational drive stats at the heart of it all, and not just focus on the scoring drive(s). Rodgers probably could have avoided last Sunday’s 4QC opportunity if he didn’t throw a bad INT early in the quarter in scoring territory. And people talk about the Johnathan Franklin fumble on 4th-and-1 losing the game, but I can tell you any advanced stat (DVOA, QBR, WPA, EPA) will give Rodgers two negatives for the sack on 2nd-and-6 and the 11-yard pass on 3rd-and-12 that set up that 4th-and-1 in the first place. He’s still accountable in that loss for things that took place before he was even trailing in the 4Q. With a stat like TD passes, we don’t care about what happened on the drive before and after. It is what it is. These 4QC/GWD stats are different because what happens before and after them will usually decide if they stand up or not. Just taking a 1-point lead with 14:50 left to play does not put you in good position for a GWD. You will likely need to do something the rest of the game too. Even before I became the guy who corrected 4QC stats for people like Elway and Marino, I was tracking successes and failures for active QBs for years. Eventually I started combining the two files to develop records for how successful QBs/teams are at such games. It was only natural for me to start quantifying things like one-minute drills, two-minute offense and the four-minute offense. I want to develop a new win probability model this offseason so I can use things like WPA and Expected Points Added (EPA) for QBs in these situations. I want to quantify late-game performance and strategy as well as anyone ever has, but it’s a process and you’ll just have to bear with me. I don’t think the W-L record, especially for a QB, is the best way to judge these things, but I know it’s not meaningless either, especially for those who sit at the extreme ends of the chart. There’s something there that’s worth exploring and talking about. Final-score analysis is heavily flawed to study the closeness of games. Because it takes too long to do this, most close-game studies have always been about the final score. Those can be very misleading. The Colts/49ers from last Sunday played a game that was a tie or one-score difference for 93% of the game before the Colts pulled away 27-7. A final-score study would reject that as a close game, but it would accept trash like MNF Eagles/Redskins from Week 1 when Washington made it 33-27 late and failed to recover the onside kick. That game was not close and the only drive involving a one-score game in the 4Q that night was Michael Vick taking two knees. Forget about the final score. 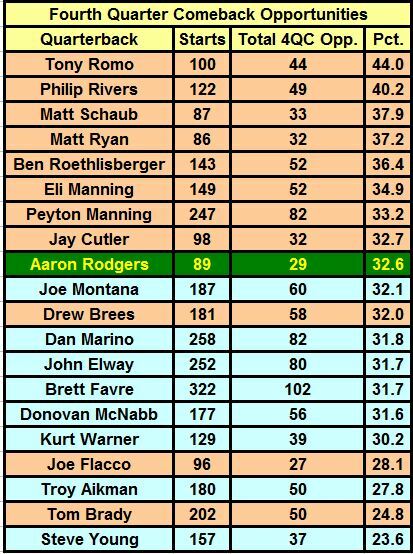 Rodgers is 20-22 (.476) in games decided by one score, and I hope it’s assumed when I say Rodgers I mean “the Packers with Rodgers at QB”. Because the record with Matt Flynn or Brett Favre (under McCarthy) would be different. Anyways, 20-22 is a hell of a difference from 9-26 (.257) at GWDs, so you can see it’s two completely different studies. That’s the one thing I would like to change in how I’ve been writing about this. It’s not so much a close-game issue for Green Bay as it is a failure to win games when they have to score the winning points in the 4Q/OT. Behind Rodgers they’re 9-26 at doing that, but 49-5 in all other games. No one has been able to explain that absurd gap in winning percentage, which is the largest in NFL history. There is no simple explanation as teams lose games for various reasons. Sometimes it’s the QB, sometimes it’s the defense and once in a while it’s a kicker. You can count how many times Mason Crosby missed a clutch kick (four games and three were long attempts) that led to a loss, but what about Tony Romo (5) or Tom Brady (once)? You can’t just adjust Rodgers’ record for these things, because they happen to all other QBs too. If you want the article that will show that, stay tuned to Football Outsiders this season. No matter who you want to blame, the Packers are 9-26 at GWDs with Rodgers at QB and that is a terrible record, especially for such a good team. Rodgers is the headline, but the Packers’ problems are the real story, and too many people are glossing over that aspect of this. As for criticism of my “Phil Simms analysis” that 4QC show the cream rising to the top, well you find fault with the 10 guys who have held the record for most 4QC wins since 1950: Sammy Baugh, Sid Luckman, Bob Waterfield, Bobby Layne, Otto Graham, Y.A. Tittle, Johnny Unitas, John Elway, Dan Marino and Peyton Manning. That’s a who’s who of the best QBs through the years with Joe Montana (5th all time) only excluded because he missed too many games in his career. The 1970s are not represented, but wouldn’t you know Terry Bradshaw, Roger Staubach and Ken Stabler all lead the decade with 15 4QC wins. Throughout NFL history, the best QBs dominate this stat as much as any other stat you can pick. But for Aaron Rodgers, he’s still somehow behind John Skelton and Tim Tebow. If that doesn’t make you scratch your head, nothing will. Enough with the “lack of opportunity” argument – I hammered on this before, but again some people think Rodgers has a lack of 4QC/GWD for a lack of opportunity. 29-35 games is plenty of opportunity. It’s not the opportunity, it’s the bad winning percentage. Here’s an updated list with a few more notable QBs and how many 4QC opportunities they have had by start. Rodgers is just above average at 32.6%, so stop it. Statistical significance vs. real significance – I want to tread lightly on this topic as this alone could be 5,000 words out of me. I fully understand the small sample size issues with covering football. I’ve done hundreds of articles and looked at many things over the years, so I know as well as anyone when we don’t have enough data to make good conclusions. 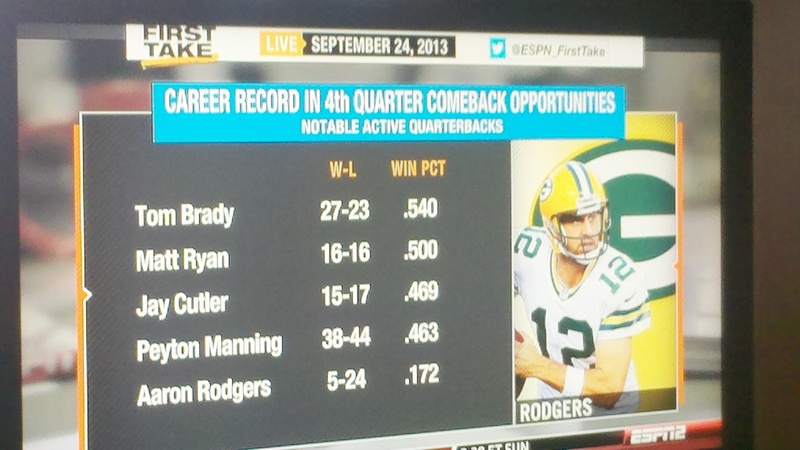 How many comeback opportunities does Rodgers need before we can statistically conclude his record is bad? 30? 50? 100? I don’t know, but I will work to find out in the offseason. In the meantime, I’m going to keep doing my job as a football analyst to present the patterns and trends that aid our coverage of the game. They may or may not have statistical significance, but once you start talking about 29-35 games, that seems rather foolish to brush everything off as being random. We can all agree the final minutes of a close NFL game are different from the rest of the game, right? The rule book changes in regards to clock stoppages and things like advancing the ball after a fumble. Time actually becomes a factor with using timeouts and managing the clock. No one cares about the game clock unless it’s the end of a half. Offenses will use all four downs while playing three-down football most of the time otherwise. There’s that sense of “if this drive is not successful, we will lose the game” that just does not come early in the game. It’s a different experience in crunch time. So how many times does a team need to experience this before they learn how to adapt to the situation? Think of your own real-life experiences in adverse situations: driving up an icy hill on your way home from work, flying on an airplane or going to a funeral parlor. Yeah, I’m going to go with the darkest analogy I could think of. Do you have to go see 80 dead people before it becomes statistically significant in how you will handle the situation? Or does it take a few trips before we know what to expect and act accordingly? That could be anything from the smell of the place, the demeanor of mourners, dealing with the image of the person in the casket, proper dress attire, etc. Sometimes we may get thrown a curve ball like a person laughing hysterically or someone throwing themselves onto the casket. In football, some unexpected things can come up too like a seven-man blitz or a dropped pass. In other sports we have seen teams like Michael Jordan’s Bulls or Sidney Crosby’s Penguins have to climb the ladder of success before winning a championship. That means getting your feet wet in the playoffs, learning how to adjust for a best-of-7 series and going further each time before eventually completing the journey to the top. Why can’t it be the same in the NFL where you have to learn to adjust to adverse situations? It shouldn’t take years upon years to do that either. I think we’ve seen enough from the Packers to reasonably conclude they struggle a lot in these types of games. If you honestly see zero significance and only randomness to the Packers being 5-24 at 4QC behind Rodgers — possibly 0-20 against winning teams — then maybe following the NFL is not right for you. That record is unlike anyone else’s record when we’re talking about an annual SB contending team. Now if you want me to break the records down to adjust for opponent, or dig deeper into the causes, then that’s fine. I’ve done such things in the past. I know the few wins the Packers do have have often been unimpressive (bad opponents, small deficits). There are patterns. I’ve done enough to know something is not right with how the Packers win and lose football games. Not to harp on it, but the comments made this offseason by Greg Jennings and Donald Driver about Rodgers’ leadership is another layer to this story. Cue the smoke/fire line. We don’t see receivers for QBs like Peyton, Brady and Matt Ryan question their leadership. We also see those QBs with great success in these close games. Maybe there’s something there, but let’s stick to numbers. I have seen all 26 losses by GB. They happened and it didn’t take a stroke of bad luck every time. This team has issues late whether it’s the QB’s unwillingness to throw interceptions so he takes drive-killing sacks, the lack of a running game, the struggling OL, McCarthy’s playcalling, Dom Capers’ defense or Mr. Crosby’s kicking. There are baselines already established. For an elite QB, a 9-26 record at GWDs is bad and no one will convince me to say otherwise. Should it improve, then credit to the Packers. But as long as it stays where it is, we have a problem here, and remember it’s a problem that has already and will continue to cost the Packers wins, division titles, higher playoff seeds, playoff wins and Super Bowl rings. After hesitantly picking the 49ers, that makes me 4-0 on the Thursday games this season. My record’s much better than the quality of those games. I’m still stinging from another difficult Week 3 that saw an 8-8 record. Onward and upward this week as we try to figure these teams out. Good god I have 10/14 road teams winning this week. Even if we don’t count Pittsburgh (neutral site), that sounds like trouble. Upset watch for Seattle, Cincy, Baltimore and Chicago? Also, back in April I had Pittsburgh beating Minnesota in London with the premonition of Adrian Peterson being contained, Christian Ponder coughing over some turnovers, Big Ben finding Sanders/Brown deep down the sideline for scores. Just a good day for the Steelers in London. Now with both teams at 0-3, I barely feel like watching this one. Though with Matt Cassel stepping in at QB, I can’t imagine the takeaway-less Steelers do not get a few this week. And I still expect the Steelers to win, dropping a Minnesota team I railed on more than any other team this offseason to 0-4. With Carolina and Green Bay on the bye week, there’s no chance to blow a late lead this week. But if there’s anyone I don’t want to see need a fourth-quarter comeback in Week 4, it will be Breaking Bad. I’ve noticed a lot of big-time series finales in recent years (Dexter and Big Love especially) waited too long to get things going and tried to rush it for a botched ending. I’m counting on big things from AMC here. If Walter White escapes the country to become a lumberjack, I’m going to lose my sanity and quit watching these series since we never get closure or final satisfaction anymore. 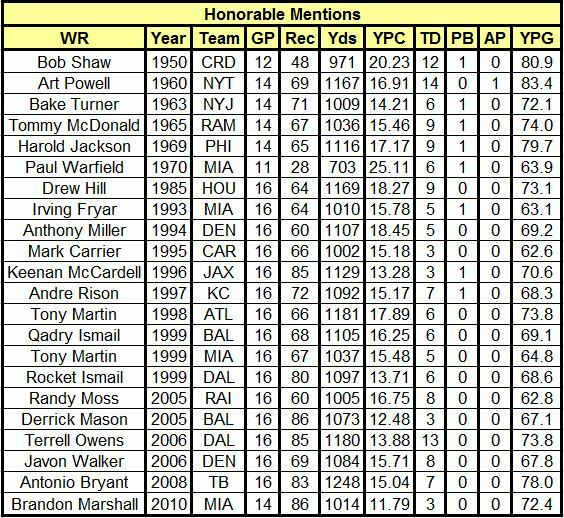 Between now and the 2013 NFL season I will be spending some considerable time on quantifying wide receivers. Much of this will be part of an effort for a book written by Nate Dunlevy (with the help of others) this year. 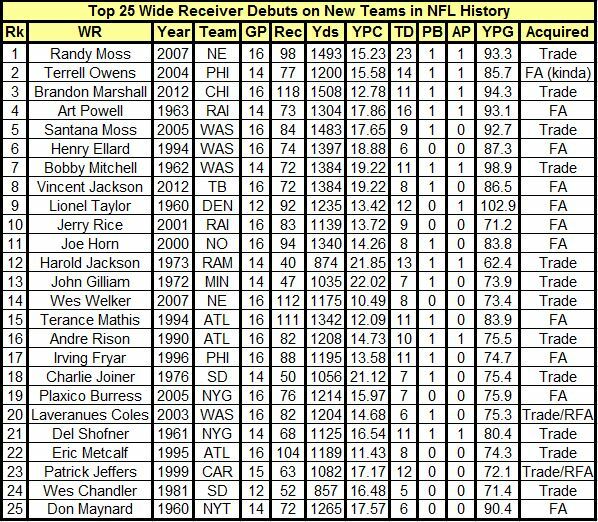 Today I completed a slideshow – a nearly 8,000-word slideshow – at Bleacher Report on the top 25 debut seasons by a wide receiver on a new team in NFL history. Ultimately 47 different seasons were discussed, but I was never able to post a table for them. Going through all of NFL history, it would be hard to find many seasons better than these ones. Something like Keyshawn Johnson’s debut in Tampa Bay could be added, and then find two more to get a top 50. But this is fairly definitive. The most interesting fact after all of this is that with these 47 seasons, not a single one produced a championship that year. Only five of these players eventually won a championship with that team, and two of them were hardly big contributors. It just goes to show how adding a WR is not a piece that will put you over the top. Especially not right away. Keep that in mind, fans of the Broncos, Patriots and Seahawks. Adding Wes Welker, Danny Amendola and Percy Harvin could be big, but a Super Bowl win in 2013 by any of them would be a first for this type of move. For the last time (allegedly) in his life, Ray Lewis will take the field and deliver his pre-game “What time is it? (GAME TIME! )” song. For the first time in my life, I cannot wait to hear it. Is it because I am getting sentimental over the final game for Ray? Not at all. I just want this f*cking game to start already. I cannot stand the two weeks of hype before the Super Bowl, and this is even for a game where I do not have a strong, personal rooting interest like I have in recent years. Sure, I want San Francisco to win, but I really don’t care if they don’t. Just get this game going. I really can’t even write anymore about it, so here is a collection of links including thousands of words and hours of solid research previewing this game. Ravens by the Numbers – The timeline of Baltimore’s improbable run, Lewis leading the best playoff defense ever, and Flacco’s unconventional success, including third down. Is Joe Flacco Underrated in the Clutch – Might as well present the facts before the MSM kills the story, using Sunday night’s game result to decide if Flacco is clutch or not. He’s better than you probably think. The Thinking Man’s Guide to Super Bowl XLVII – Putting the data together to look at the matchups, and what should decide this game. NFL Quarterbacks: Career Playoff Drive Stats (2013 Edition) – More of a general article, but a lot of focus on Flacco’s improvement this postseason, and some amazing numbers from San Francisco in the last two playoff games. You still have about 8 hours before this thing gets going. So you can read some of this, or watch Dan Marino’s body language on CBS. If there’s a downer to tonight, it would be having to listen to Phil Simms and Jim Nantz call one more game this season. But at least the Patriots are not involved. The year never ends for me, as at least three articles will be written every week this year. Will I find enough to talk about in the dog days of March, or May thru July? Only three games left in the NFL season, excluding the Pro Bowl. Actually the Pro Bowl would probably count as -0.5 games, because that’s how bad it has become. A drawback to writing for multiple sites is that you have to avoid repeating information when writing a preview for the few games left, but my early week broke up the monotony with a much-needed trip down memory lane. Part of what makes this the best time of the (NFL) year, also makes it the worst when people overreact to playoff results. One of the more epic playoff games ever, Baltimore at Denver, deserved an epic-sized recap. See what the refs screwed up, how Chris Kuper disappointed in his return, Joe Flacco’s big-play postseason, the worst defensive mistake in NFL history, and whether or not the Broncos played it too conservatively late. Also, the Falcons and Seahawks play one of the most exciting fourth quarters in playoff history, and Matt Ryan finally gets a chance for a game-winning drive in the playoffs. He only had 0:25 to do so. Finally a look at more dominant wins by the 49ers and Patriots. If you think Peyton Manning’s playoff career should be defined by 11 losses and eight one-and-done seasons, then you have some cold, hard facts to read up on. A game-by-game recap of Manning’s eight early playoff exits, looking at the real reason his teams lost that day, and the unique circumstances that have produced such a record. Stats, tables, GIF images, the whole nine yards this week. One example: Two yards away from beating the Chargers, and your rookie TE forgets the snap count and gets beat for a sack. Can you believe Joe Flacco is going to start as many AFC Championship games (3) in five seasons as Peyton Manning and Dan Marino each started in their career? But that says more about the Ravens than Flacco, and even though he said he was the best quarterback back in April, he’s still not an elite player. A look at what kind of long-term contract Baltimore should offer Flacco. An information-filled preview for each game on Championship Sunday. Find out how the Falcons not only own the fourth quarter under Matt Ryan, but are also the top scoring differential team in the first quarter since 2008. 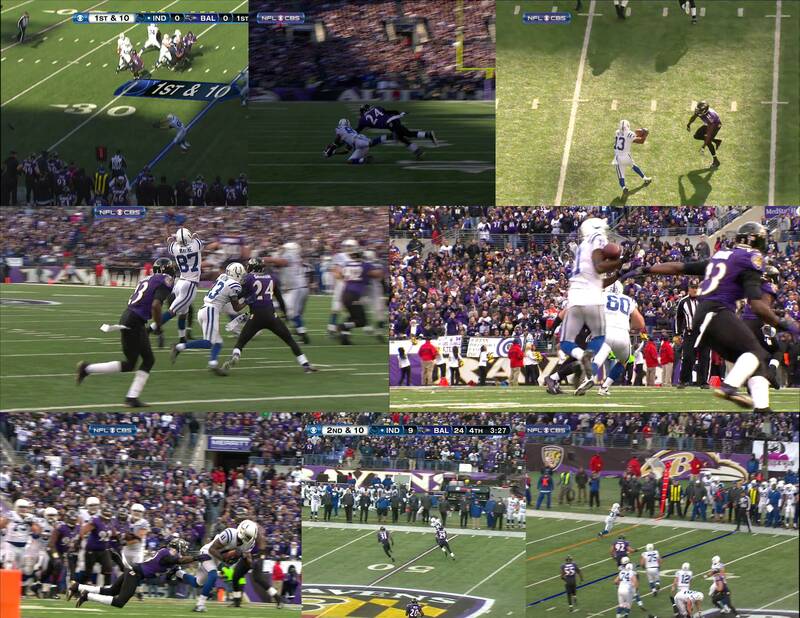 With Ravens/Patriots, a look at Baltimore’s fatigue, the bad news for rematches in this round, the great runs by No. 4 seeds since 1990, and New England’s absurd home-field advantage. 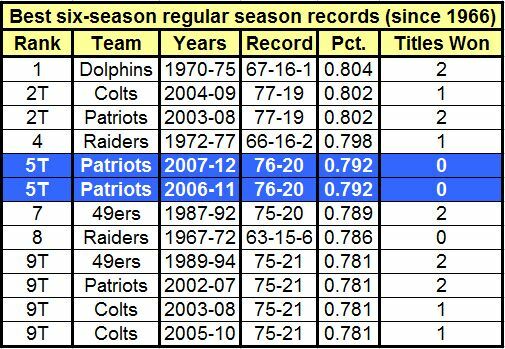 Previewing the AFC Championship again, this time focusing on how the Patriots need a Super Bowl win to validate historic success since 2007. Despite a 76-20 regular-season record since 2007, these teams have come up empty in the playoffs despite being the favorite each time. There is still plenty to play for with the Ravens as well, making their third AFC Championship since 2008, and looking for the Hollywood ending for Ray Lewis before he retires. For all the people who went 1-3 or worse last week, going 2-2 doesn’t sound so bad, though the AFC, my favorite conference, had my two wrong picks. Please, no game-deciding special teams plays this year. Last year was brutal enough. The best weekend of the NFL season is upon us: the Divisional Playoffs. I am ready for an upset or three. I am prepared to go 4-0 or 0-4 on my game picks, which is exactly why this weekend rules. I spent a ton of time writing the history of it last year (Part 1 and Part 2), now this week I spent time summing up stats and anxiously looking forward to these four matchups. We had three close games on Wild Card weekend, one real crapper in Green Bay, but it took the Seahawks in the last game to get a game-winning drive. Russell Wilson led it, and led-blocked on it for Marshawn Lynch. Otherwise we watched the Bengals go 0/9 on third down, and the Colts dropped the ball in Baltimore. Andrew Luck set several rookie playoff records, but with the loss and Robert Griffin III tearing his ACL, Wilson emerges as the last rookie standing in the playoffs. Consider this my season review of Andrew Luck’s rookie year. A look at the type of offense he ran and why the Colts were successful despite having little to surround Luck with, and his generally below-average traditional stats. Luck’s rookie season came to a quick end in the postseason in a 24-9 loss. His 288 passing yards were the most by a rookie QB since Sammy Baugh way back in 1937. His 54 attempts and 28 completions were rookie playoff records, but it wasn’t enough for the Colts. They became the first offense in playoff history to compile over 400 yards of offense (419) and score single-digit points. Too many dropped passes doomed the Colts, as we came up with 8 drops in this one. Find out about Baltimore’s fatigue, the wild card that is Colin Kaepernick, Seattle’s early start time in Atlanta, and Houston being the latest rematch for New England in the playoffs. Expect the Broncos and Falcons to have a Super Bowl rematch? Don’t count on it. Just 3 of the last 22 Super Bowls have been between No. 1 seeds. A look at the decline in their postseason performances, along with what Atlanta and Denver can do to make it to the big game. Here I get even more seedy. 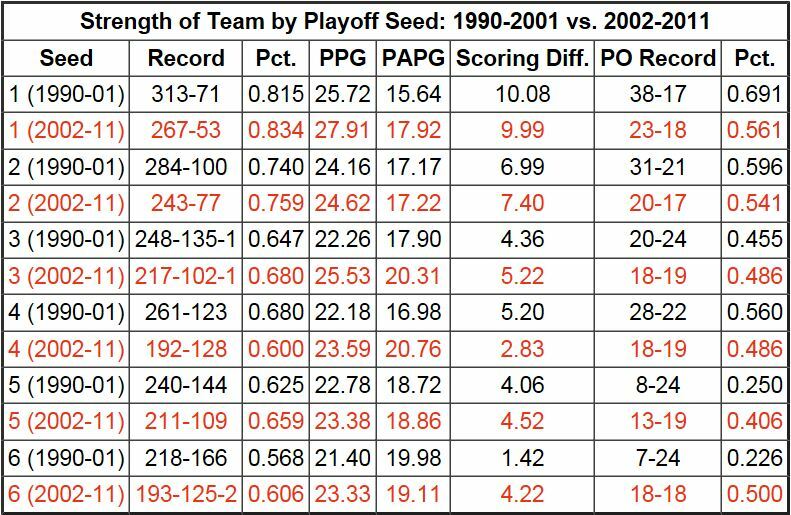 Want a quick reference for every playoff seed since 1990? Want to know how often a No. 2 beats a No. 3 in the Divisional round, or what a No. 1 does vs. a No. 2 seed? We have all that here, and much more as I looked into the playoff seeds in the 12-team format (since 1990). A lot of interesting finds, but nothing better than this table that sums up the gap closing between the top and bottom seeds, resulting in a more exciting, unpredictable postseason. I set the bar too high last week. Sure, only 3-1 with the Colts loss, but did nail the correct point total for the three winners while coming very close to the loser’s score. That probably means I’ll be way off this week, which is expected with tougher games. All the favorites won last week. That won’t happen again this week. Like I said, you can easily go 4-0 or 0-4 this week. That’s why I love this week. Playoffs. I have already been feeling some postseason pressure to get things done, but it was a successful week and am looking forward to more significant research to put out there before we head into the offseason. This intro would sound much better read by Don Cheadle. Last year I recapped every 4QC/GWD in playoff history for each round (can be found under Captain Comeback 2011 archives). The Wild Card round is home to the all-time NFL comeback, Houston’s 32-point collapse in Buffalo 20 years ago this week. It also has the only two playoff games ever ending on a defensive score in overtime, and both games involved the Packers. Finally, the only two playoff games to have two lead changes in the final minute are also on Wild Card weekend. The best game last season ended up being the Steelers in Denver, with the longest game-winning TD pass in NFL playoff history from Tim Tebow to Demaryius Thomas. I have a feeling Sunday’s games could live up to that one again. It’s the year-end review of the regular season, with a ranking of all 32 offenses in the clutch. Go figure the Colts and Broncos were among the best, while San Diego was the only team in the league without a single comeback or GWD in 2012. It may be a slideshow, but you are getting 12 articles in one here. A look at each playoff team’s fatal flaw, whether it be something tangible or a perception they must overcome. Framing each team the proper way before the postseason starts. Houston blitzed Andrew Luck on 75.9 percent of his drop backs this week, but the battered offensive line actually held up enough for one of the most efficient offensive performances of the year for the Colts. Luck threw perhaps his pass of the season with a 70-yard touchdown strike to T.Y. Hilton in the fourth quarter on a 3rd and 23 to ice the game and the Colts’ 11th win. The four-game preview format of TMG works best here, looking at each Wild Card matchup. Also included is a review of some postseason studies I did in the last year on home-field advantage, quality wins in the regular season, and marquee blowouts in 2012. Andrew Luck, Robert Griffin III and Russell Wilson will be the 12th-14th rookie quarterbacks to start a playoff game. A look at their record-breaking success, and whether or not one of them can make more history by reaching the Super Bowl. Not only was this the argument for Peyton Manning clearly being the MVP over Adrian Peterson in 2012, but you also get a chance to view all the MVP voting results (AP award) for 1986-2011. A great resource given this information is nowhere to be found elsewhere in one place. Find out who the only TE to receive a MVP vote is, or the only cornerback. I’m not a fan of picking the final score, but here’s a shot at it.